The climbing season is finally upon us! In a few short days I will make this seasons first attempt up Rainer to check out the conditions of the glacier and routes. Hopefully with this winter's good snowfall the mountain will be in great shape. The things I will be looking for are general snow level, camp site locations, route locations, rockfall hazard, bergschrund locations, and crevasse melt out. All those things will effect the route decisions and general path that the routes follow this year. It should be a great season! Also coming up quickly is the Mount Baker summit attempt on the Easton Glacier 19 May. We will be spending four days up there making our way towards the summit and practicing skills. There is a spot or two still open if you want to join the trip! It is a great introduction to big mountain climbing and will be a true test of your skills. If your planning to attempt one of our big mountains this year be sure to step up your fitness training. 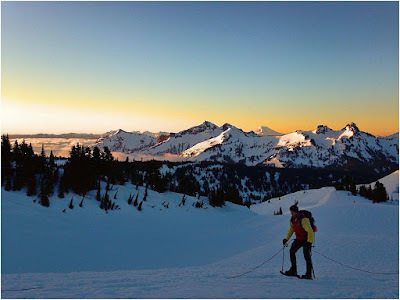 Just jogging a few miles week will not prepare you for the epic endurance climb of the mountains in Washington. If you have any questions feel free to contact us. There is several training plans online and the twelve week plan is pretty good. You really just need to be able to carry a pack uphill all day and still have a bit in reserve for unexpected situations. Our first two Rainier trips are full but there is several opportunities still available later in the season. Don't miss out on this years climbs and contact us if you have questions.